Last summer, I experimented with making lacto-fermented pickles. These are the type of kosher dill pickles that you often find in New York delis. It reminded me of a giant science experiment with the result being a huge jar of incredibly delicious Garlic Dill Pickles. My family loved them so much that they didn't last long. 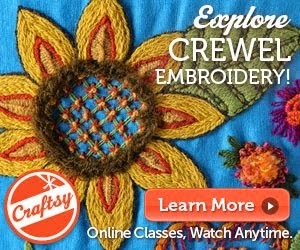 This summer I have been making them again so I thought I would share how I do it. 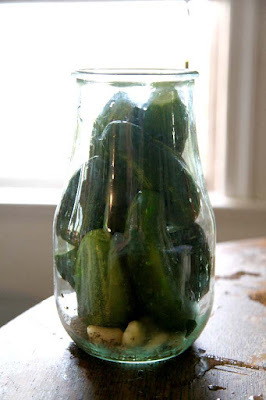 This is a great recipe to do with kids because it is super easy, there is no stove or heating needed, and watching the pickles ferment in a glass jar is a whole bunch of fun. As they ferment, the color of the water changes, bubbles come and go, the dill and mustard seeds float around. By the end of the fermentation, you won't believe how delicious they are. Finding the large jars is the hardest part. I'm always on the lookout at yard sales. These are nice and available from Crate and Barrel. The lids can be taken off while the pickles are fermenting and then used to close them in the fridge. (They are also good for making sauerkraut. You can also find very large Ball jars at many stores at this time of year. You will need a half gallon jar. For each jar, you will also need a smaller jar with a lid that will be filled with water. The small jar needs to fit inside the larger jar. You will also need a towel to cover up the jar while it is fermenting. Wash your jar so it is nice and clean. 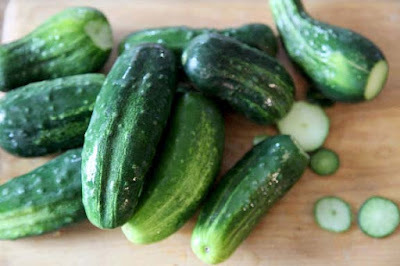 Wash your cucumbers so they are free of any dirt. Cut off the blossom end of each cucumber. You can tell the blossom end because it is usually rounder than the stem end. Place your spices in the jar. 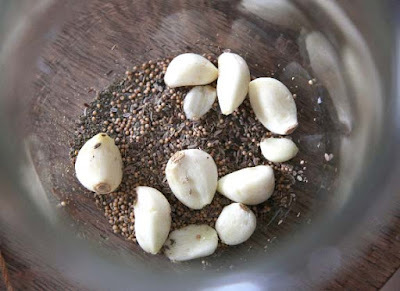 Add the garlic cloves and the optional leaf. 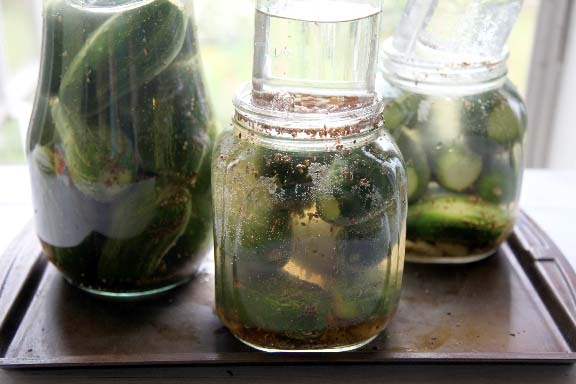 Fill your jar with the cucumbers. This is the fun part - seeing how many you can squeeze into the jar. 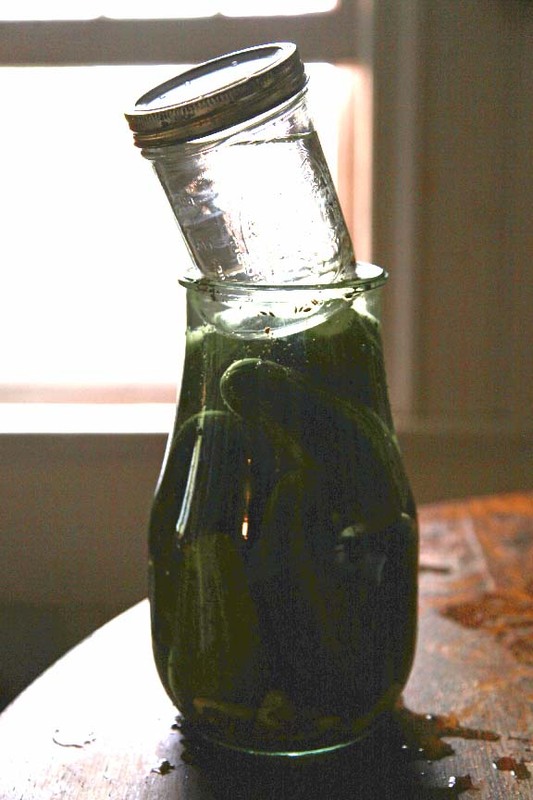 Optimally, you will want the cukes to be about an inch below the rim of the jar. Add the salt to the water and stir until it dissolves. Place your jar where you will be letting it ferment. 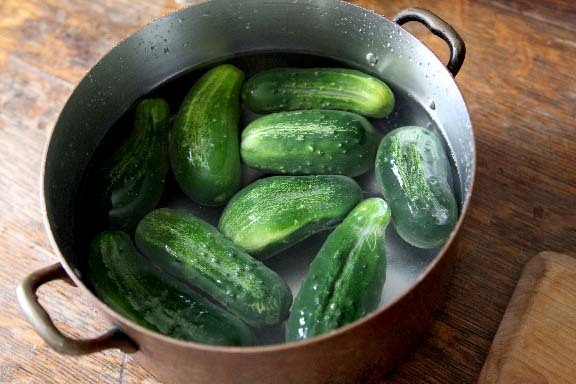 Pour the salty water over the cucumbers until they are submerged. Fill the small jar with water and close it with a lid. Place the jar on top of the cucumbers so they will be submerged. The filled jar keeps the cukes from floating. I had extra cukes so I made some more in some smaller jars. Here they are set up to ferment. This is taken about 12 hours after they began fermenting. 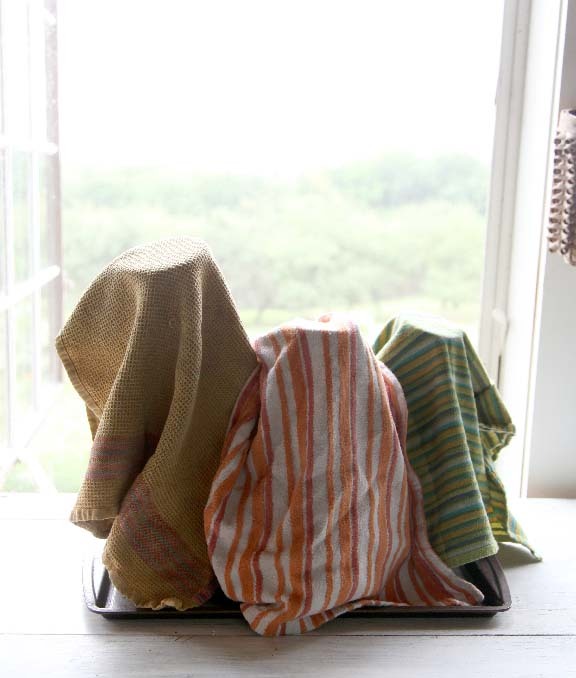 Cover your filled jar with a tea towel and wait. Here are my pickles under their shrouds. The next day, your cucumbers will begin looking different. You will see bubbles rising to the top of the jar. Here is a close-up of my pickles after about 12 hours. You can see the bubbles and the seeds rising. Depending on the temperature of your home, the pickles will be done in from 5 days to 2 weeks. Scum may develop on the top of the jar and you can skim it off. In the heat of the summer, the pickles ferment much quicker. I usually begin tasting them on the 5th day. I slice off a small piece of the top cuke and see if it is done. If it is tasting good, I slice the pickle in half to make sure it is totally fermented. If you think they need more flavor, let them keep fermenting. If a scum forms around the fermenting cuke, just wash it off. It isn't harmful. The liquid will be cloudy - don't be grossed out by it. It is full of good stuff for you like probiotics and other good cultures. When mine are done, I move them to the refrigerator where they crisp up. They keep for up to 6 months or longer but honestly, they never last that long here at our farm! 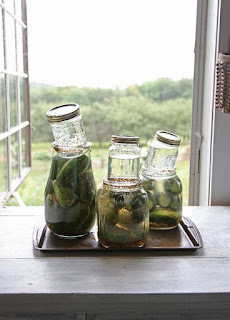 You can distribute them amongst smaller jars - just pack the brine and the spices in with the pickles. Do not hot pack them though. No need to - they will keep and if you did, it will ruin them. Feel free to change up the spices and play with the recipe. 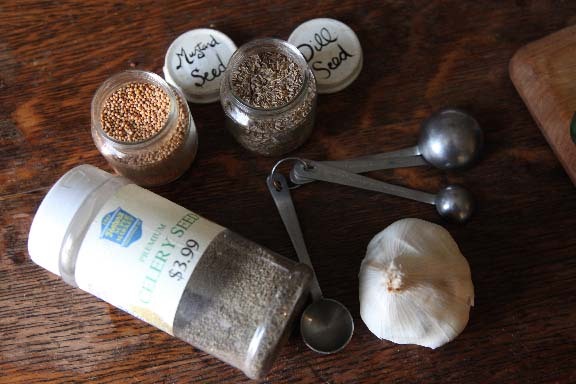 Don't like garlic? Leave it out. Like things spicy? Add a hot pepper. Fermenting is a lot of fun to experiment with. 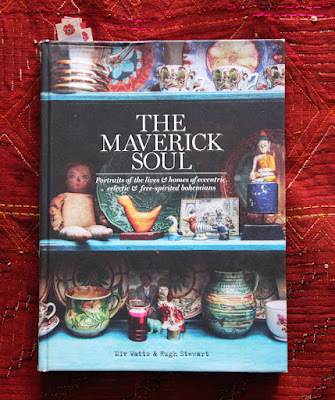 Give it a go this weekend and let me know what you think! I am all excited to try this...but my garden has been such a failure this year. Hoping my brother-in-law will toss some cukes my way. Thanks for sharing this. This sounds like the way I used to make dill pickles in a crock. You've inspired me to go to the farmers market and buy some cukes. Will use my small crock and let you know. I've been wanting to try this! My 4 year old daughter absolutely loves pickles - this will be so fun for us to do together. This looks like a grand science experiment! I just tried something similar, kimchi (made with cabbage; you leave it out on the counter to ferment for a few days) and I would say it was a success :) Next year when we have cukes again I should try doing pickles, because I bet they're yummy. Thanks for sharing. Kristin, if you weren't already a successful designer, you could find fame & fortune in the world of pickles, I'm sure! Read your recipe last Thursday evening, picked up about 3-1/2 pounds of pickling cucumbers and some fresh garlic at my local 'farm store' on Friday afternoon, and had everything submerged by Saturday morning. With ten cloves of garlic, I did wonder about the potential for 'aromas' to be an issue, but was pleasantly surprised on that score - there was a very slight 'earthy' odor, but nobody else in the house seemed bothered. Taste-tested a pickle last night & decided thsy needed another day, but this evening, they are UNBELIEVABLY GOOD!